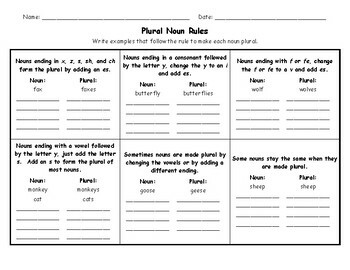 After reviewing plural nouns, I use this worksheet as a group activity. I have groups work together to find examples of the different plural nouns in their library books. They then write the plural noun in the correct box. Each rule is listed in a box with an example. Nouns ending in x, z, s, sh, and ch form the plural by adding an es. Nouns ending in a consonant followed by the letter y, change the y to an i and add es. Nouns ending with f or fe, change the f or fe to a v and add es. Nouns ending with a vowel followed by the letter y, just add the letter s.
Add an s to form the plural of most common nouns. Some nouns are made plural by changing the vowels or by adding a different ending. Some nouns stay the same when they are made plural. This page may be used as an assessment, worksheet, or group activity.